In August 2007, Denmark’s renowned Louisiana Museum of Modern Art presented ‘Richard Avedon: Photographs 1946-2004’, the first major retrospective devoted to Avedon’s work since his death in 2004. To accompany the exhibition this beautifully produced catalogue was published. 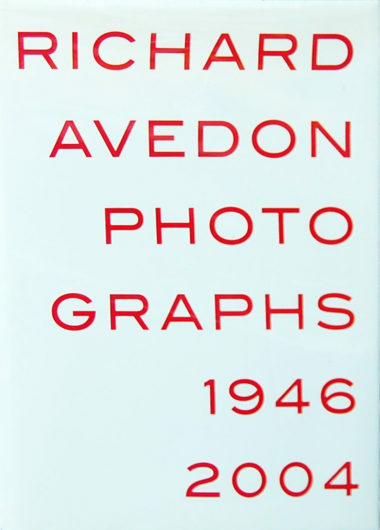 Designed by the renowned Danish graphic designer Michael Jensen, and featuring deluxe tritone printing and varnish on premium paper, the book includes 125 reproductions of Avedon’s greatest work from across the entire range of his oeuvre – including fashion photographs, reportage and portraits. It also contains texts by Jeffrey Fraenkel, Judith Thurman, Geoff Dyer, Christoph Ribbat, Rune Gade and curator Helle Crenzien.